Finally the Feds have allowed the Oregon Department of Fish and Wildlife to euthanize the sea lions, (Protected by the Federal Marine Mammal Act) on the Columba and Willamette Rivers to stop the slaughter of the salmon and steelhead runs. The Willamette Wild Steelhead Runes have improved after Sea Lions were allowed to be euthanized at the fish ladder of the Bonneville Dam and Willamette Falls. ODFW stated, “Some of the best winter steelhead returns in recent years”, as native steelhead have been able to recover since the ODFW have been allowed to euthanize California sea lions. The sea lions have been consuming 25% of the runs. The PFMC is meeting this week (April 6 – 12th) to determine what will be the allowable harvestable surplus for fishing quotas for Tribal Fisheries, Ocean Commercial, Ocean Sport and In-River Sport fishing. Some of the preliminary returns are looking better for the In-River fishing but I am skeptical of the allowable limits due to the Hoopa Deceleration of them taking 50% of the Tribal share. Where will the extra fish for In-River Sport fishing come from if the National Marine Fisheries Service allows the extra 30% Hoopa is declaring they will harvest. Hoopa already uses the weir they install on the reservation to take extra fish and listed Coho salmon. 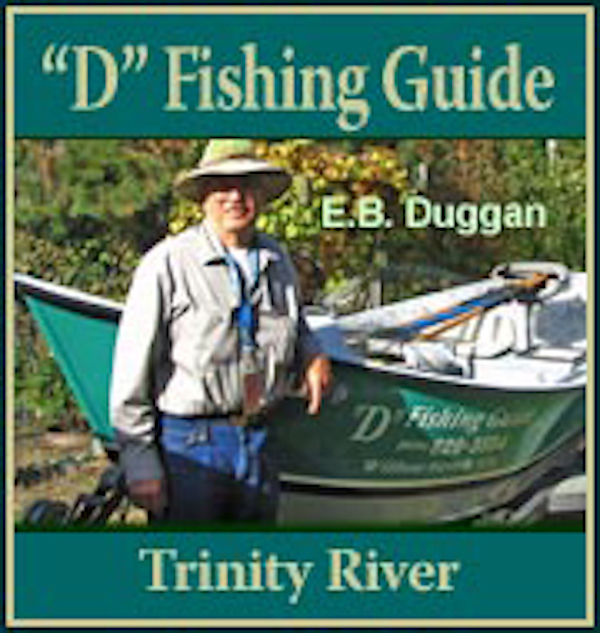 The winter rains are still coming and making fishing on the Trinity and other and other north coast rivers difficult. The predicted storms for the next week are not looking good for the rivers. At least the spawning streams for are assessable for the steelhead and Coho to do their thing this year. Klamath: March 18, 2018-2019 season totals; Bogus Creek salmon season total Chinook 2,734; Coho 23; Shasta River season total Chinook 20,692, Coho 39; Scott River Chinook 404, Coho 681. These are all native salmon and steelhead returns for the Upper Klamath River Basin. From what I can see is that we could have some great fishing in two to three years. Fishing: I have seen very many fishermen out on the river dur to the high water and rains. In between storms Todd LeBoeuf of Tiger TS Guide service, has been trying to sneak out on the upper part of the river to fish. Last week he was able to get his customers six nice adult steelies but he said it was a wet experience for all! Mid-Klamath: Iron Gate Dam is releasing 4,560cfs. and the upper river is really flowing big time! From the amount of flows at the gauging stations on the Klamath I would expect there will not be any fishing for the next week or so. Lake Conditions: Whiskeytown is 86% of capacity (a decrease of 4%) with inflows 2,228cfs and releasing 3,125cfs on to Keswick and the Sacramento River. Shasta is 90% of capacity (an increase of 2% plus 5ft) with inflows of 31,806cfs and releasing 25,482cfs into Keswick. Keswick is 89% (an increase of 8%) with an inflow of 30,337cfs and releasing 30,220cfs into the Sacramento river. Oroville Lake is 81% of capacity (an increase of 0% plus 1ft) with inflows of 22,661cfs with releases of 26,436cfs into the Feather River. Folsom Lake is 80% of capacity (an increase of 6% plus 7ft) with inflows of 10,450cfs with releases of 10,275cfs into the American river. Trinity Lake: the lake is 29ft below the overflow (a decrease of 5ft) and 82% of capacity (an increase of 3%) inflows are 7,821cfs and releasing 226cfs into Lewiston Lake with 7,595cfs being diverted to Whiskeytown Lake and on to Keswick Power Plant, which is releasing 30,220cfs into the Sacramento River. Trinity River flows and conditions: Lewiston Dam releases are 307cfs and water temperatures of 53 degrees and air at N/A as of 12:00pm today Sunday Apr. 7, 2019. Limekiln Gulch is 5.40ft at 798cfs and water temps of N/A. Douglas City is 7.73ft and flows of 1,472cfs. with air temps of 58 and water at 48.8 degrees. Junction City is 4.40ft at 2,030cfs. Helena is 13.24ft at 3,060cfs with water temps of 48 degrees. Cedar Flat (Burnt Ranch) is 9.13ft at 5,349cfs. South Fork of the Trinity is 8.11ft at 4,245cfs. Willow Creek is estimated at 9,594cfs and air is 62 degrees and water at 48 degrees. Hoopa is 20.03ft at 14,626cfs and is 48 degrees. Water flows at the mouth of the Trinity River at the Klamath are estimated to be 43,064cfs. Klamath: Iron Gate is releasing 4,560cfs. Seiad Valley is 7.68ft at 9,705cfs. Happy Camp is estimated at 12,063cfs, the Salmon River is 6.81ft at 6,629cfs, Somes Bar is estimated to be 21,809cfs. Orleans is 13.50ft at 28,438cfs, the Klamath River at Terwer Creek is 19,453ft at 48,453cfs and water temps of 48.7 degrees. Flows for the Smith River at Jedia Smith is 15.35ft and flows of 21,268cfs. and flows at Dr. Fine Bridge are 20.94ft at N/A cfs. Temperatures in the Valley last week were 74 hi with a low of 47. Rain for the week was 1.43in with total rain for the water year to date of 59.45 inches, with snow of 4.5in. in the valley to date. We will be seeing light rains and scattered heavy showers during the next week. Some of the heavy showers predicted will give up to 1.5 inches of rain in some areas and snow in the higher mountain regions. This will help increase the snow pack for summer releases.